Columbia County 911 dispatched Kinderhook Firefighters and Valatie Rescue at 2:58pm for a reported two car accident on Route 9 in the Town of Kinderhook. The accident was between Smith Road and Presidential Drive. Stuyvesant Falls FD and Stuyvesant FD were requested by Command to assist with traffic and a helicopter landing zone. 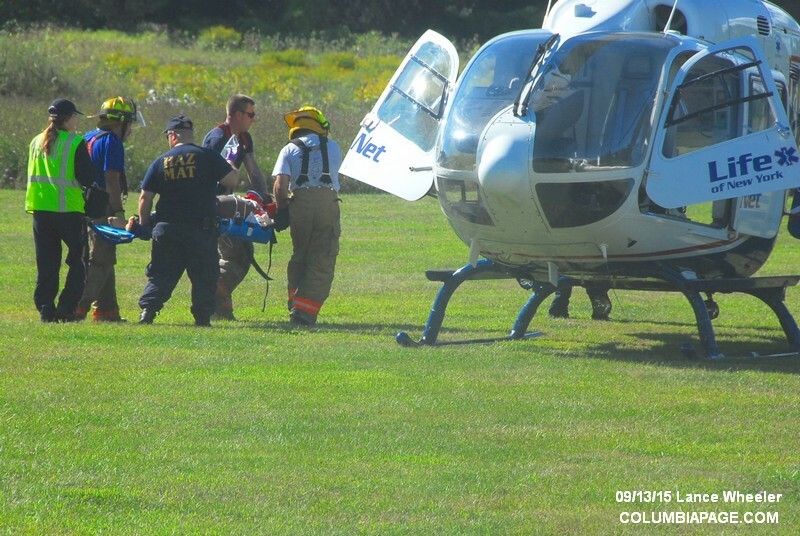 Chatham Rescue responded mutual aid and a LifeNet helicopter responded to the scene. The Columbia County Fire Coordinators Office and Columbia County EMS Coordinators Office were on the scene. It was reported that one patient was flown and three were transported by ground to Albany Medical Center and one patient was transported by ground to Columbia Memorial Hospital. Firefighters were back in service at 7:04pm. 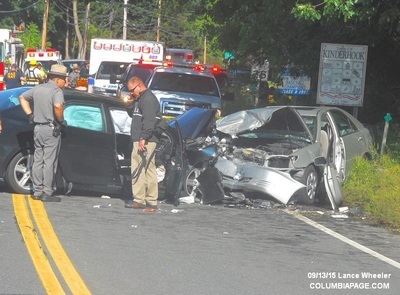 New York State Police are investigating a 2 Car Fatal collision that occurred on State Route 9 in the Town of Stuyvesant. The crash occurred at approximately 2:55 p.m. when Harriet M. Simpkins, 85, of Kinderhook, was southbound on State Route 9. Simpkins veered into the northbound lane and struck a vehicle operated by Rahmal Spann, 28 years old, of Hudson, head-on. Simpkins was transported to Columbia Memorial Hospital where she was pronounced deceased. Rahmal Spann, a 14-year-old male passenger, a 9-year-old male passenger and a 5-year-old male passenger were all transported to Albany Medical Center. The 14-year-old suffered minor injuries. The 9-year-old child suffered severe injuries to his extremities. The 5-year-old boy is in critical condition with a head injury. The 9 and 5-year-old children have been admitted to Albany Medical Center .